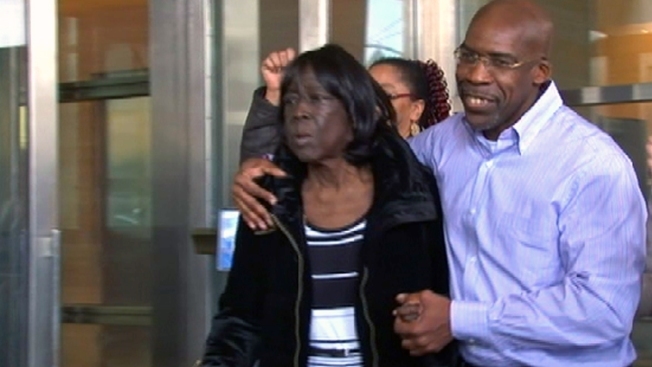 An innocent man who spent nearly a quarter century in prison for a murder he did not commit walked out of a Brooklyn courtroom a free man Tuesday, with his mother by his side. Jonathan Fleming, now 51, was in tears as he hugged his lawyers and family after his conviction was thrown out by a judge. "I feel like the time I felt when he was born and the nurse bring him to me," said Patricia Fleming, the mother of the wrongly jailed man. "That's how happy I was." From the start, Fleming proclaimed his innocence in the 1989 shooting of his friend Darryl Rush. He said he was vacationing in Disney World. He had plane tickets, videos and postcards from his trip and the testimony of his own mother. The New York Times first reported the questions in this case, including that investigators, hired by his attorney Anthony Mayol, interviewed a key witness who says she lied and singled out Fleming in exchange for having felony charges against her dropped. Prosecutors' own review produced a hotel receipt that Fleming paid in Florida about five hours before the shooting -- a document that police evidently had found in Fleming's pocket when they arrested him. Prosecutors also found an October 1989 Orlando police letter to New York detectives, saying some employees at an Orlando hotel had told investigators they remembered Fleming. Neither the receipt or the police letter had been provided to Fleming's initial defense lawyer, despite rules that generally require investigators to turn over possibly exculpatory material. Patricia Fleming, 71, was with her son in Orlando at the time of the crime and testified at his trial. "I knew he didn't do it, because I was there," she said. "When they gave my son 25-to-life, I thought I would die in that courtroom." Questions about Fleming's conviction surfaced amid an ongoing investigation into past murder convictions in the borough. "I'm not saying he was framed," said Fleming's attorney Taylor Koss. "I'm saying it couldn't possibly be a mistake." Since Brooklyn District Attorney Ken Thompson took office in January after defeating longtime incumbent Charles Hynes, his office has been reviewing dozens of murder convictions dating back to the 1980s. During his campaign, Thompson criticized some prosecutions and the pace of review in cases where there was concern of wrongful conviction. The Fleming case was investigated out of Brooklyn’s 90th precinct, where retired detective Louis Scarcella had worked. Dozens of cases worked by Scarcella have been reopened by the D.A. 's Conviction Integrity Unit after a high-profile 1990 murder case he investigated was thrown out.